One of the most basic and important skills in the game of volleyball is passing. Passing is important because it is the first contact made on the ball when a serve is being received. The goal of the pass is to get the ball to the setter in a controlled manner. This helps the offense run smoothly and efficiently. When a player is able to make an accurate pass to the setter, the setter has more options to set up the attack on the ball, and the chances of scoring a point are increased. There are two types of passes that are used when receiving a serve: the forearm pass and the overhead pass. These passes are also used when the opposing team is attacking the ball. The forearm pass involves the arms being used as a platform to control the ball. 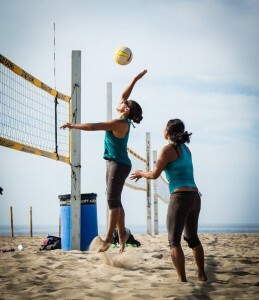 The overhead pass involves playing the ball overhead using hands and fingers, similar to the action of setting. Ready Position– Before the ball even crosses the net, you should be in an athletic stance ready to move and react. Your feet should be shoulder width apart with your knees slightly bent. You should lean forward a little, and have your hands and arms in front of you, ready to create a platform. Platform– A platform is made by holding your arms out straight in front of you and clasping your hands together. One hand can be placed on the other hand with your thumbs parallel, this is the cupping method. The area between your wrists and elbows is where you want to contact the ball. A good platform will produce a controlled pass if both arms work together as one. With the elbows locked out and the platform below the waist, the ball will bounce off the platform in a true trajectory. There is no need to swing the arms when making a forearm pass. Lift the ball with your legs by bending your knees, and shrug your shoulders forward as the ball hits your platform. Move to the Ball– Watch the ball as it leaves the server’s hand and try to anticipate where it will fall on your side of the net. Always try to get directly behind the serve. Move your feet and get in a position to pass from the mid-line of your body, keeping the ball in front of you. Create your platform and square up to your target to make an easy forward pass. If you cannot move directly behind the ball, adjust the angle of your platform by dropping your inside shoulder. If the ball is on your left side, drop your right shoulder, and if the ball is on your right side, drop your left shoulder. Make sure the ball is contacting both arms at the same time. Ready Position– Just like the forearm pass, this pass requires you to be in an athletic stance with knees slightly bent and feet ready to move. Your feet should be shoulder width apart and your hips, shoulders, and knees should be square facing the target. Playing the Ball– Track the ball as it crosses the net and angle your forearms toward the target. Keep your hands firm and close together. Push straight through with your fingers and hands. If the ball is coming with a lot of speed, there is no need to make big forward movements with the arms.